No baptism or census records seem to exist for this Robert Esson who must have been born around 1810 according to an age of 32 recorded in prisoners’ log in 1842. It is hard to identify who he was therefore. Perhaps newspaper articles from the time of his trial will shed more light on this question. But it seemed a dramatic enough story to tell. Robert Esson was found guilty in 1841 of stealing a grey horned quey, a young cow or heifer, from a grass park named as Drummelduan in Crimond parish on or around Tuesday 24th of August 1841. Two days later, if the court’s charge sheet was accurate, he took a horse and bridle from a shed at the blacksmiths shop of John Adie of nearby Strichen. That same day he then stole a riding saddle from James Mutch of Nether Ironside or Mill Brae in New Deer. His trail, while taking these things, covered 15 miles or so in the North East corner of Aberdeenshire, from Crimond to Strichen and then to New Deer. It seems he probably meant to ride away with his new property. Perhaps he had no work or saw a chance to better his lot. He did not get far before he was detained however. Judging by the host of witnesses called to his trial there is little wonder. On 24th September 1841 he was found guilty and sentenced by Aberdeen Sheriff’s Court to 14 years deportation to Van Diemens land, Tasmania as it is today. Hanging for horse and cattle theft had been abolished in Scotland not too many years before. The last person hung for this offence was a George Watson in 1811 who was caught after being tracked for 150 miles because of a broken shoe of the horse he took. Perhaps Robert Esson’s sentence seemed more lenient , but like many deported convicts his fate was just as dark. In April 1842 he was being held on the prison hulk Justitia at Woolwich docks in London. There he was recorded in the prisoner’s log at one point as having a violent temper, a point which might not have gone well for him. Troublesome prisoners were confined to the lower decks alongside others of similar disposition. On 1st June 1842 he was on the convict ship The Waterloo as it left Sheerness docks for Tasmania. The Waterloo was a 414 ton merchant ship, built in Bristol in 1815, and used from 1829 to transport convicts to Australia and Tasmania. 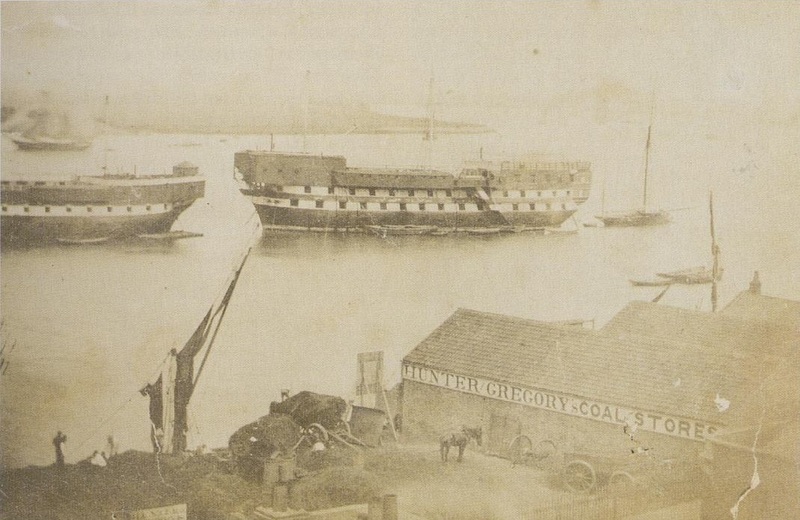 By 1842, 27 years after it was built the the Waterloo, like many convict ships, was far from seaworthy. Almost three months after leaving Sheerness, the ship’s surgeon, Dr Henry Kelsall persuaded Captain Henry Ager to put in to Cape Bay to pick up fresh provisions, as many on board were suffering from scurvy. The ship was anchored in an exposed position and Captain went ashore, leaving the ship in charge of the first mate. 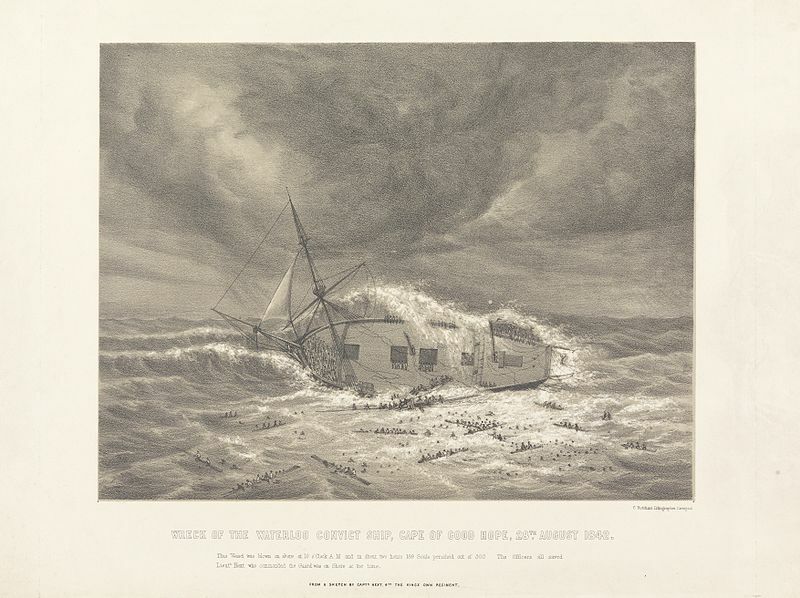 On 24th August 1842 the ship, along with others was battered by a powerful westerly storm. The Waterloo’s cables parted and in the absence of the Captain, Its suggested the first mate could have helped by ordering the masts cut free. If so, in the absence of the captain he declined to do so and the ship was washed broadside on, onto the beach. Just outside the breakers, within sight and hearing of horrified onlookers on the shore it first broke in two and was then destroyed completely. There were no life boats in these time and despite the convicts being released from their chains, and the efforts of many on the shore, there was great loss of life. An eye witness sketch of the event showed convicts and crew clinging to the ship and wreckage. Am equally badly anchored troop ship, the Abercrombie Robinson, was also swept onto the beach, but being seaworthy and in the handled of the Captain, all aboard from 500 to 700 soldiers and crew managed to escape unharmed. A number of other ships in the Bay survived the storm unscathed. The Cape town press of the day described the scene graphically, and criticised the captain for leaving the vessel and the ship’s owners for the common practice of the day of using ships unfit for service to transport convicts.